I’ve harvested the first batch of produce from the SoilFixer trial beds down on Plot #59. I’ve been carrying out a soil improvement product trial this year at the invitation of the folks at SoilFixer.co.uk, testing two of their compost and/or soil enhancement products, versus ordinary compost and untreated soil. It’s a very rough, ready and rather unscientific method that I’m following: I set up four small raised beds, planted broad beans and sowed two varieties each of turnip and beetroot. In mid-June I reported on the good growth so far. I took a look at the beds last weekend and realised that it was past time to pick some crops. I freely admit, I’ve left the harvesting a bit too late, and should probably have done so sooner, but Jo and I were on holiday in mid-July and things have been hectic before and since. 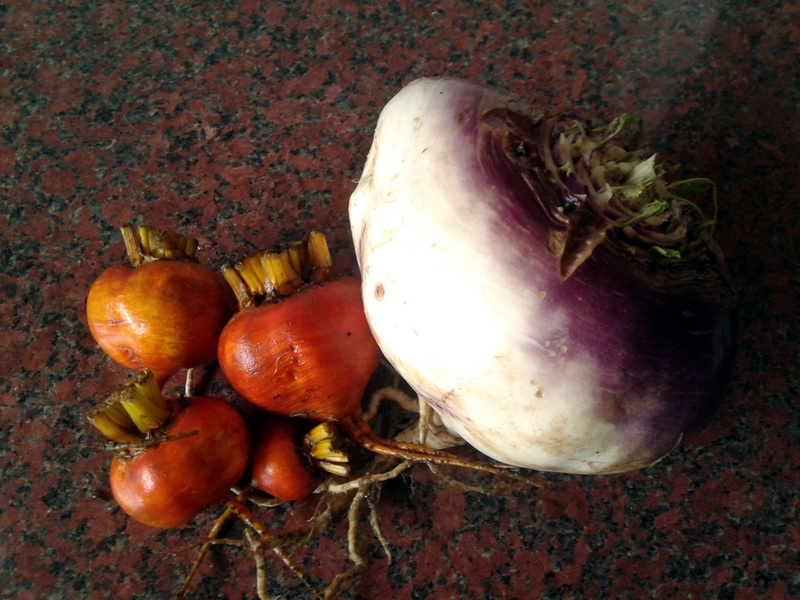 Nice-looking golden beetroot and… turnip, or deadly weapon? You decide. Would I be happy to use SF60 again? Most certainly, and I plan to use up the rest of the tub I was sent in next year’s greenhouse containers. Likewise, I’ll be adding a good scoop or two of C.H.A. to my home compost bin when I put the lid on it at the end of the year. But would I be happy to put my hand in my pocket and buy a supply of SF60 or C.H.A. for my personal use? Well, that will depend on my doing some further testing, and also reading the results of the other triallists’ efforts (which were hopefully a bit more usefully clear-cut than mine). Hedging my bets, I’d say that if I was trying to grow a specimen crop – super-hot chillies, say, or something tropical in a greenhouse, or a heritage vegetable that I wanted to save seed from – and wanted to give my growing medium a boost, then I think SF60 would be a good product to use. Commercial growers might want to investigate further. I’m not so sure about the C.H.A. for my own use. I don’t think my compost quality requirements are stringent enough to require much in the way of amendment. Again, if I was producing a lot of compost for a commercial or specimen growing project then it might be worth trying. But I’d need to see more evidence of a clear-cut and dramatic compost improvement before I’d be able to commit. On reflection (hindsight being a wonderful thing) I could have designed and executed the trial much better; either by growing a smaller selection of crops, or even a single crop – ideally one that wasn’t quite as prone to pest-problems as broad beans (blackfly) or cabbages (slugs) – and assessing how many plants of usable size and quality had been grown by a particular date. Either that or growing something simple to assess, like potatoes (again though, potential pest and disease problems there) and simply harvesting them all at once and weighing the yield from each bed. Or I could have tried something like strawberries; grown the same variety, then assessed both yield and flavour with a blind taste test. I could also have done better with the production of the compost used in the first two beds. Unfortunately I used too much touch grass in the original mix (the stems didn’t break down properly) and the bags I used didn’t drain as well as I’d hoped. Plus, I started the compost off late, or rather, early in the year, which didn’t give it enough time to break down fully into the humus-rich material that the C.H.A. product is designed to produce.